A commitment issued yesterday by European Central Bank (ECB) president Mario Draghi that the bank’s governing council is prepared to inject up to €1 trillion into the monetary system through asset purchases has nothing to do with providing a boost to the real economy. Rather it is a pledge to the banks and financial speculators, both in Europe and internationally, that the ECB stands ready to assist them in conditions of falling inflation. As expected, the ECB made no change to its main refinancing interest rate of 0.05 percent, which it set in September. Consequently all attention focused on Draghi’s press conference amid reports there was dissatisfaction over his leadership style, reflected in a tendency to make off-the-cuff remarks that were not approved by the governing council. Two months ago, Draghi indicated that the goal was to purchase financial assets to bring the ECB’s holdings back to levels last seen in 2012, implying an expansion of about €1 trillion. Following these remarks there were claims the proposal did not enjoy unanimous support and divisions had emerged in the ECB’s governing body. The main opposition to quantitative easing measures has come from Germany, with some backing from other northern European countries. The concern over low inflation and the threat of deflation arises from the fact that lower price levels increase the real debt burden on banks and other financial institutions. 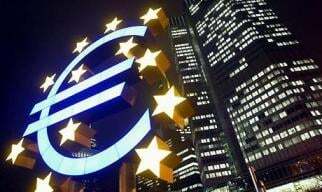 Following the press conference, the euro fell by 0.6 percent against the dollar to its lowest level since 2012 and stock markets rose, with the FTSE Eurofirst 300 up by 0.6 percent. While there is general agreement in financial markets that Draghi has prevailed in the short term, the longer-run divisions persist. Richard Barwell of the Royal Bank of Scotland told the Financial Times that Draghi won the battle of the balance sheet target but whether he won the war remained to be seen. “I doubt the hawks offered an unconditional surrender on sovereign purchases,” he said. The term “sovereign purchases” refers to the buying of government bonds by the central bank. These purchases were at the centre of the quantitative easing program of the US Federal Reserve, which ended last month, and the stepped-up asset purchasing program of the Japanese central bank, announced last Friday. The ECB has not carried out such measures because of opposition from Germany, which insists they go beyond the ECB mandate. Pressure on the central bank to take action has grown following last week’s shock decision by the Bank of Japan (BoJ) to intensify its program of quantitative easing. The BoJ will now undertake purchases of government bonds at a rate equivalent to 15 percent of gross domestic product (GDP) per year. This will push down the yen’s value and increase the relative value of other major countries’ currencies. In the four days after the BoJ decision, the yen’s value fell by 4 percent against the euro, underscoring one of the main consequences of the Japanese decision—to increase deflationary pressures in other countries. The ECB meeting was held amid a series of reports showing that the deflationary grip over the European economy is tightening. Earlier this week the European Commission cut its growth forecasts for the euro area. It said GDP in the 18-nation region would rise by only 0.8 percent this year and 1.1 percent next year, down from its previous projections of 1.2 percent and 1.7 percent respectively. The commission’s own report indicated that the downturn is not simply a case of “lingering” effects of the financial crisis but is more deeply rooted. “With confidence indicators declining since mid-year and now back to where they were at the end of 2013, and hard data pointing to very weak activity for the rest of the year, it is becoming harder to see the dent in the recovery as the result of temporary factors only,” it stated. One of the report’s most significant features was lower growth projections for Germany, the largest European economy. Almost no growth is expected for the second half of this year and the commission forecast growth of 1.1 percent for 2015, compared to its prediction in May of 2 percent. Italy, the third largest economy in the euro area, is in its third recession in six years and its economy is expected to contract by 0.4 percent this year. The commission cut its projected growth for Italy to 0.6 percent, half what it predicted in May. Despite the injections of money into the European economy by the ECB, small and medium sized enterprises, whose expansion is vital for economic growth, face continuing difficulties obtaining credit because banks are weighed down by bad debt. The ECB moves on monetary policy are not about providing a stimulus to the real economy and promoting increased employment. The principal result of an increased flow of money is to boost the position of the banks and financial speculators. So far as the mass of the population is concerned, the program of the ECB and all the other institutions of the European Union is directed to imposing austerity and worsening living standards. This was underscored on the eve of the ECB meeting. The Irish Times published a November 2010 letter from the bank’s then president, Jean-Claude Trichet, to the Irish finance minister. Trichet warned that the ECB would cut off emergency funds unless the Irish government agreed to spending cutbacks and a restructuring of the financial sector. Two days later, Ireland applied for a bailout on those terms. The austerity agenda being imposed by the ECB, national governments and other European authorities under the name of “structural reforms” is ongoing. Shortly after the ECB meeting concluded in Brussels, a clash took place in the centre of the city between police and several hundred workers following a 100,000 strong march earlier in the day to protest against cost-cutting measures being introduced by the newly installed Belgian government. The government, which only came to power a month ago, has committed itself to lifting the retirement age, cancelling an inflation-linked wage increase next year and initiating cuts in the health and social security budgets.